Sometimes I will bury the lead in an entry. Most of this time it is done on purpose because I want people to figure out what the most important part of the story is for themselves. However, I’m sure there are times where it is just another example of sloppy writing like the kind that Dan Brown foists upon us. Yesterday I spent my morning wandering the aisles of Wal-Mart with Shannon and a couple representatives of Dr. Pepper photographing them purchasing toys for Toys for Tots. The pictures are to be used in The United Way of Story County’s press release on Toys for Tots. That sounds like a pretty important story. It certainly sounds like an interesting story, but it was not the most important part of the event for me. I want to make sure that when I start on this narrative, the most important part of the story is in the front and center, so I’m taking what I consider to be the lead part of the story out and making it into its own entry, so it doesn’t get buried under the rest of the Toys for Tots narrative. I wrote before about how I didn’t need to share the terms of my wager with Shannon with the world. I am not a person who needs to gloat. The victory itself is usually more than enough for me. 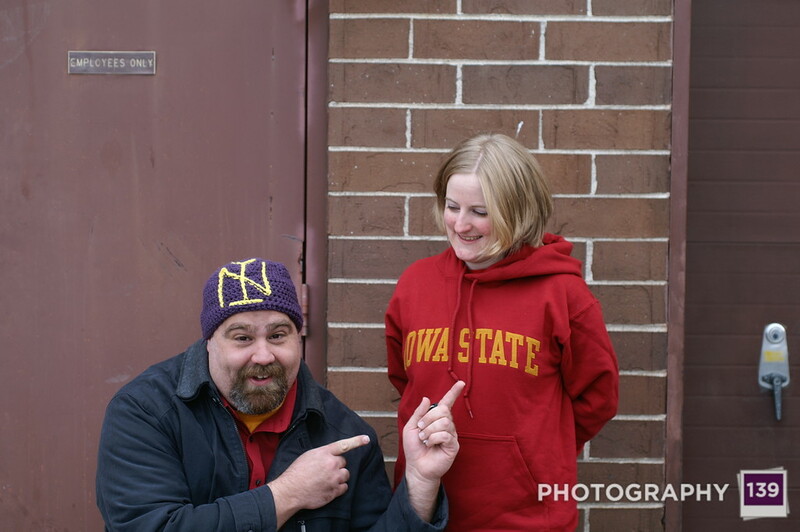 I shared with you that one of the end results of the wager was that I ended up with a sweet UNI beanie that Shannon made and she ended up with an ISU hoodie. If UNI would have beat ISU, I would have been forced to put on the beanie immediately following the game and worn it around and through the McLeod Center and to the car. 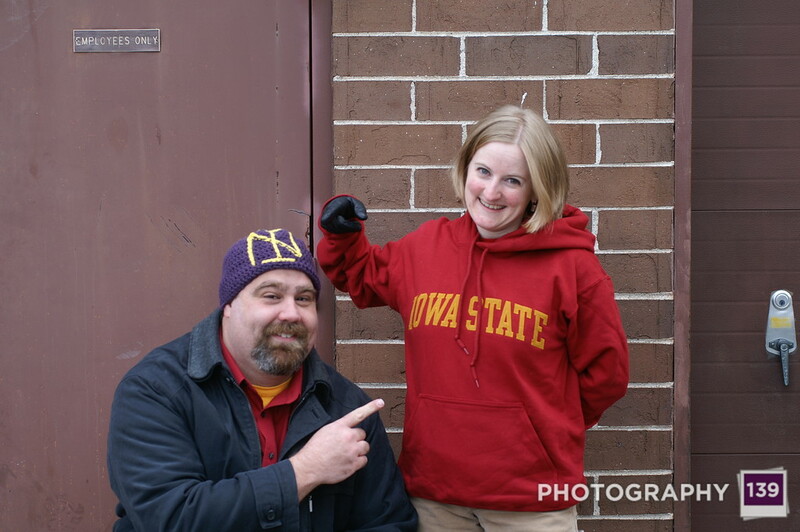 Furthermore, I would have had to wear the beanie to the ISU-UNI tailgate in 2010. ISU won the game and so Shannon was subject to the terms of my wager. She simply has to wear the hoodie on to the Iowa State campus and have the experience photo-documented. This trip will of course include a stop at the Jack Trice statue outside of Jack Trice Stadium. Shannon has requested that this trip be put off for a couple of months because of the severe cold weather and her low tolerance for extreme cold weather. I have agreed to wait. Because of this, I was not expecting to see the Iowa State hoodie until March or April. So yesterday was Jesse’s birthday. As far as I know the only thing he got for his birthday was the Big Juan and churros that I bought him at Taco Time and the dessert that Jay baked him. So maybe I got one of his birthday presents. I arrived at 9 am at Wal-Mart. In the entry to Wal-Mart there were several shopping carts filled with toys, presumably for tots. I introduced myself to one of the guys from Dr. Pepper and waited for Shannon to show up. Out of the top of the black coat I could see the distinctive color of a cardinal hoodie. “So it is starting to grow on you?” I said while trying to cover my feeling of victory. Shannon said that I’d get a chance to some “bonus pictures”, then she quickly made up some excuses for why she was wearing the hoodie. Something about it being the only clean one that she had and she wasn’t allowed to wear her UNI hoodies to work. Then she revealed that this was just a cover story by admitting that she had worn it this past weekend, but then quickly tried to cover up the reason why behind “liking new clothes”. Regardless of the motivations that she tells herself and the motivations that she tells the world, I was able to get some bonus images of Shannon in her new cardinal and gold. So before getting into the whole Toys for Tots experience, I would like to share a couple of those images that her dad (the truck driver for the day) was talked into taking. In a related note, Toys for Tots received thousands of dollars in toy donations on that day, but that isn’t the lead story.